The use of artificial intelligence (AI) is transforming medicine in order to solve problems in the health industry. The redesign of healthcare would help medical professionals to design new treatment plans. It is possible with methods that will suit each patient individually. Nowadays, most citizens are not conscious about how artificial intelligence is making everything easier for us. In our Master in Artificial Intelligence Online, you can attend to several seminars such as AI related to medicine. Artificial Intelligence enhance the capacity to store and process large amounts of data. This is possible thanks to algorithms which translate the volume of information into functional tools. This technology allows devices and machines to get closer to us and provides several benefits in healthcare. Reduction of human errors. Every patient is a specific and different case; therefore, medical professionals have to be very sensitive and treat each patient individually as an isolated case. However, the possibility of human errors are always there, and we can avoid it with AI’s help. AI can help doctors to overcome the monotonous and time-consuming tasks, reducing the possibility of false diagnosis. Reduction of costs. Thanks to new technologies, there is a more efficient way to get doctor assistance without having to visit a hospital or a clinic. This is due to the existence of the AI assistant online care, which can show the medical records online. Virtual assistance. The technology known as Telemedicine allows specialist to assist their patients by using computer programs which make real the possibility to treat patients who have several difficulties and, therefore, they are not able to go to a hospital. Creation of bionic organs. Thanks to the improvement of AI, the creation of bionic organs has been increasing and studied in a deeper way, and thanks to that, bionic implants imitate the original function of the organ in a closer way. Bots are computer programs which select the key words in articles and give an answer related to those words, their other name is AI Chatbots. 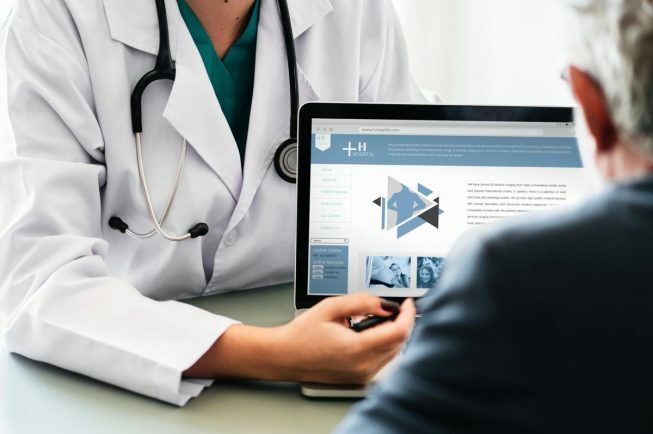 Also, chatbots use several technologies: natural language processing, which analyses the language to understand what the patient is talking about, and technological methodology, which provide fluid conversations and responses in order to guide the patient. Chatbots for patient. They function as personalized medical care to remind patients their appointments and medications plans. Also, with a questionnaire, those bots can analyse the risks and symptoms of the patient’s problem or illness. It can directly fix an appointment with the medical professional required. Some bots are created and designed in order to assist people with mental health issues. However, they do not diagnose but they do encourage the patient to book an appointment with his or her doctor. Chatbots for medical professionals. They help the hospital to deliver patient care and decrease the rate of re-admission. After the patient has left the hospital, the chat bot helps the doctors and nurses to keep in touch in order to interact and get the patient’s latest information such as diagnosis results, medication or even treatment. HealthTap: which uses AI to help people find the cause of their symptoms and encourages the client to book an appointment with his or her doctor. This chatbot provides advice and information to those people who don’t have much knowledge of health. Therefore, it helps people that don’t think they need a doctor to get conscious about the possible danger that those symptoms may hide. Florence: This chatbot focuses on therapy as a ‘personal nurse’ who reminds us when to take our pills and medication. We have to include the name of the medicine, the doses we need per day and at what time we need to take it and the nurse will automatically remind it to us. There are a lot of possibilities and improvements that AI can provide to Medicine and to the healthcare industry. This is one of the main aspects for which Artificial Intelligence is used for, although with time there will be a lot of new possibilities and ameliorations. Also, those will help to save people’s life and make everything easier for all of us. If you want to change the future with AI, join us. Our Master in Artificial Intelligence Online is waiting for you!